ECC Mummies and Masterpieces - Tu B'Shevat Edition! 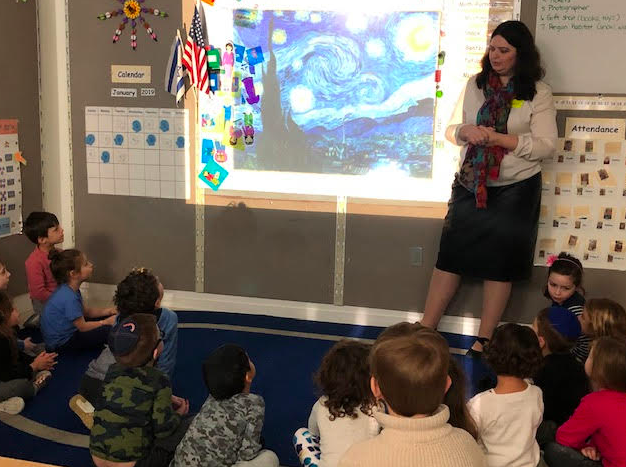 Mummies and Masterpieces visited Pre-K classes for Tu B'Shevat! Students learned how trees and fruit may be incorporated into art and about artists who used nature in their artwork. For example, Vincent Van Gogh's Starry Night contains pieces of a cypress tree. Students also viewed various works of art by Giuseppe Arcimboldo who used fruit to create parts of people's faces. They especially liked seeing how grapes could be used to look like a man's beard - wild! After the children looked at different works of art, everyone was given natural materials and cut-up fruit to make their very own work of art - they created their own "faces" on wooden discs using leaves, twigs, and fruit. Drawing connections between art and the Jewish holiday was fascinating and students can't wait for their next Mummies and Masterpieces session!